Squatters in the JB Spray Building, [Russel Street, Nottingham, NG7 4FL] prevented Severn-Trent water from cutting them off. Squatters in the JB Spray Building, [Russell Street, Radford, Nottingham, NG7 4FL] prevented Severn-Trent water from cutting them off. On tuesday afternoon [16th June] workmen were observed in the street outside, marking the road, ready to dig. They intended to cut the supply to the building, from out in the road. Folks then went out and sat in the road to prevent any work from being started. A few supporters were scrambled and arrived to help out. Some comfy chairs and tables were deployed. Tea, bread and jam supplied, and folks settled down. The workmen found the whole issue amusing and took photos of each other, with the protesters :-) All were amused. They were all quite friendly gezzers, with no personal issues about the situation. The Advisory Service for Squatters were contacted for advice, and they were helpful in talking directly to water company managers. The situation lasted 2 - 3 hours, before they all went away. People are of course, on the look-out for their return. The J B Spray Building has been re-squatted for the 4th time [in as many years], over the last few weeks. This large industrial building need some care and attention. 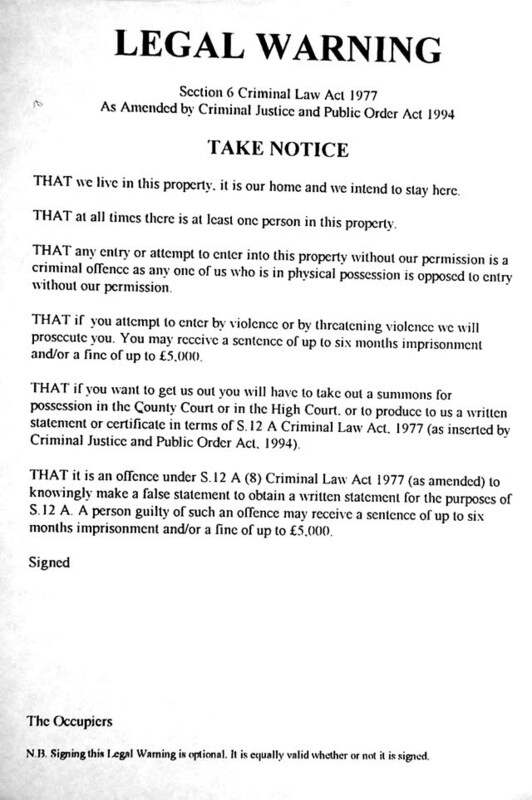 Each time people have been evicted by the owners obtaining a temporary possession order. Then, years go by, and on peoples' return, they discover that the building has fallen into yet greater dis-repair. The upper stories of the building are now so decrepid. For a grade 2 listed building, this is such a shame. Imagine, if people had been previously left alone, then they would have helped in maintenance, improvements and given the building, and the street, some security. Still, back in the real world ...... owners may say they are entitled to possession and all court has to do is establish that fact to grant orders. FOR FUCKS SAKE. where is the sense in it all? The law supports this state of affairs and in my opinion completely lacks the social responsibility that communities should expect. Many squatters care about such places. There are so many empty properties. There is so much need for shelter. So many communities are blighted by the dereliction of their surroundings. and all the law can think about is the owners possession. Squatting is about direct action to take some direct responsibly for the improvement of community, and i wish them well. In my experience of squatting, owners / authorities generally use electric and gas supply as a weapon to help them remove folks. Action on water is a new one on me. Water being so basic to human existence. The squatters handbook [p37] points out that where water is already connected: Section 1 Schedule 4A of the Water Industry Act 1999 makes it unlawful to disconnect "any dwelling which is occupied by a person as his only or principle home". PDF / page 137 for details of the building. None. The owner is unwilling to sell the property and prefers community uses."